The bright and beautiful Mexican Diamond blankets will add color to your yoga studio or your favorite spot to practice yoga. 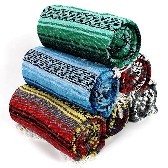 These high-quality traditional blankets feature bright colors, a solid weave and are very soft for added comfort. These blankets can be washed in a regular washing machine and will soften as washed. Use this blanket for warmth, comfort, extra padding, or to lend support for yoga positions. Blankets can also be used for a picnic or a light blanket.